TL;DR Ready-to-play Qemu images for under-rated architectures (ARM, MIPS, PowerPC, SPARC, AARCH64) to play with, with all the tools builtin to understand memory corruption on non x86 environments here . Update (2018/05/15) The Mega.NZ repository was cloned to Google Drive, available here . Become a ninja on non-x86 architectures ! A few weeks back, I came across @Fox0x01 awesome tutorial to get started with learning debugging and exploitation techniques on ARM. If you haven’t checked it out, make sure you add this on your to-read list. I have been initially developping gef for the same reason, to learn more about non-x86 architectures. So in the same spirit of openness that Azeria has shown, I am releasing a few Qemu virtual machines to start immediately playing with ARM, MIPS, PowerPC and AARCH64 architectures! All you need is Qemu. Then download the link to your image, and unzip the archive. If you are on Linux/OSX, run in a terminal (or double-click) on the ./start.sh script, when our Windows friend would simply need to double-click the ./start.bat. Each VM will also TCP forward its SSH port for easy interaction. On Linux/OSX, just run ./ssh.sh. Windows users will need tools like PuTTY. Those images are battery-included, development tools, compilation and debugging tools too. Ever wondered what SPARC assembly looks like? Always feeling itchy to learn about memory corruption on PowerPC? Wait no more! Link to Google Drive . Unless stated otherwise, root password is root, and an low privilege account called user is created. Update: the current ARMv6 image is based on a Raspberry Pi image. Therefore, the username is pi , password raspberry and is sudoer NOPASSWD. I will update the image soon to fix this. Already existing fantastic projects such as Vagrant for Linux/*nix and modern.ie for Windows help us getting quickly functional environments we can use in labs. But they are only providing Intel-based images. The closest thing to what I wanted when I started exploring exotic architectures was aurel32 Qemu pages , which provides great Qemu images. Unfortunately, they are using extremely old kernels and/or Linux distributions, making it too hard for a quick plug-n-play experience. Interestingly when developing gef, I talked with many people interested in learning about non-x86 archs but felt like they don’t know where to start. So my hope is that those images will be the start to a lot of fun. All the VMs come with 2 compiled ELF binaires: a very simple hello-world to start easy with the new architecture, run it, start gdb-ing around it to understand the architecture basics (memory layout, function call convention, GOT+PLT, stack canary, etc.) and a simple-bof, which is a simple Stack Overflow ELF to start on the way of understanding memory corruption. So take a look at this . Ok so what’s next ? Well, those VMs were built from scratch using Qemu, which takes forever. 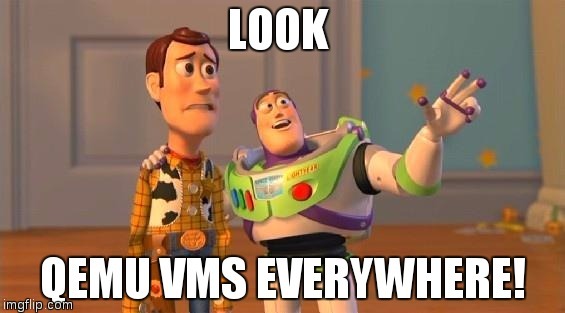 I will add some more VMs on other arch soon (MIPS64, S390x, etc. ), but if you like that, simply drop me a line on Twitter, to keep me boosted.